It's November. The weather gets bitterly cold when the fall season, with its gold palette of colors, is turning into winter. 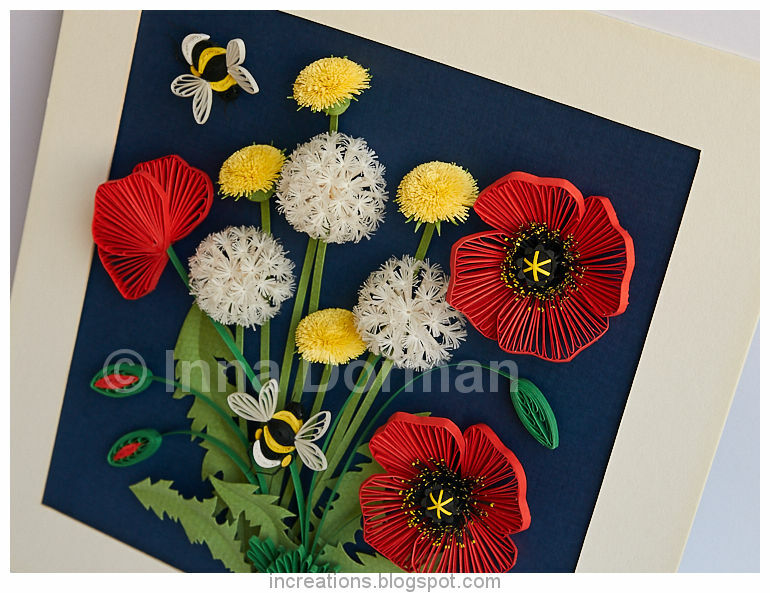 But I want to bring you a piece of hot summer with its green leaves, red poppies, yellow dandelions and bumblebees. This project had started as a tutorial on how to make a dandelion seed head, but later developed into an elaborate picture. When the tutorial was finished, I had a few dandelion seed heads left and decided to use them for a colorful picture. I added some yellow dandelion flowers, but wasn't satisfied. 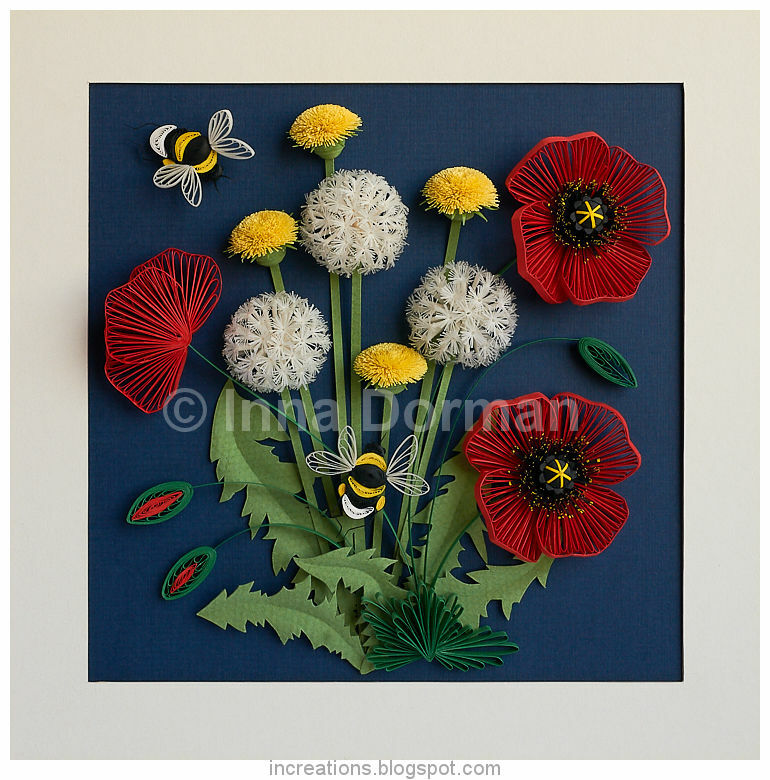 So I put in red poppies to create contrast with the pale seed heads. Finally, I added two bumblebees and at this point the design felt complete. 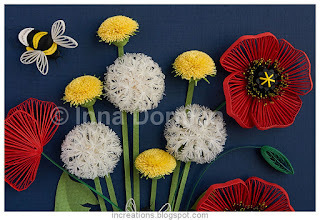 If you remember, I already made a similar picture in the past, and explained how to make yellow dandelion flowers and poppies here. 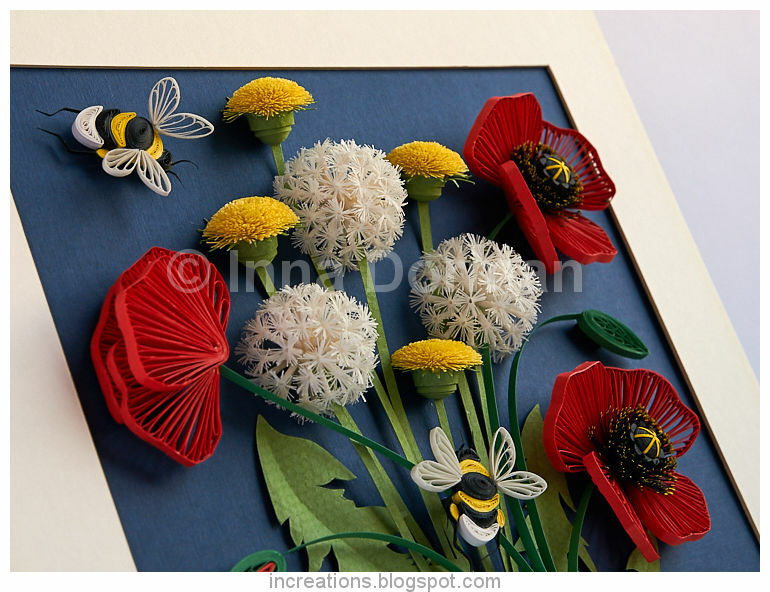 Size of the picture is about 7" x 7" (17.5 x 17.5 cm) not including the frame. Lovely Inna. Thank you for sharing. I love each flower. You are so talented. Es precioso, me encanta el conjunto de las amapolas con el diente de león :P. Uyyy que chiquito, me ha engañado la foto, jajaja, parecia mas grandote, jeje. Es un cuadrito muy manejable para cualquier riconcito con ese tamaño. If there is anything that violates your policy, please let me know.